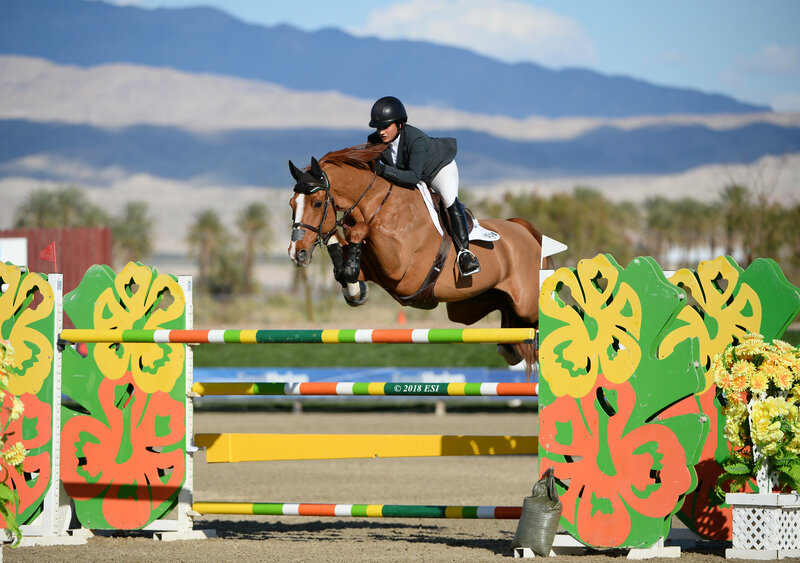 Exhibitors are jumping “hoof-first” into the second half of the HITS Coachella Desert Circuit in Thermal, California where even more prize money and Championship awards are up for grabs. 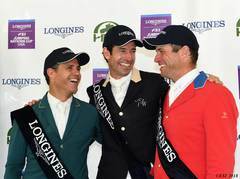 The coming weeks offer the Equo Riding Apparel 2nd Half Circuit Champion Awards and the Horseware Ireland Grand Circuit Champion Awards, a $25,000 USHJA International Hunter Derby, World Championship Hunter Rider week and of course, the coveted AIG $1 Million Grand Prix. In the jumper rings, the week started with the $5,000 Johnson Horse Transportation Open Welcome where John Perez and CHIANTI CLASSICO took home the blue ribbon in a time of 35.028. Following Perez, in the second place position, was Shawn Casady and CAS in a time of 37.335. Third place honors were won by Michelle Parker and CUPILOR in a time of 37.535, followed by Julia Madigan and FARFELU DU PRINTEMPS taking home the fourth place ribbon in 37.728. Macella O’Neill and LEEN VILLAMOURA came in fifth place in a time of 38.044. Vani Khosla and BILLY MEXICO jumping to a first place finish and their third Grand Prix win in the $30,000 SmartPak Open Prix presented by Osphos. Second place honors were awarded to Zazou Hoffman and SAMSON II in a time of 43.440, followed by Tamie Phillips and CRISTAR in a time of 43.845. Fourth place honors would be picked up by Hayden Zadel and TRISKEL DE KERLIVEN in a time of 48.263. Jamie Barge and LUEBBO would pick up the fifth place ribbon with four-faults in 43.228. In the $10,000 Electronic Vet 1.35m Jumper Classic, Joie Gatlin and DAKOTA OF THE LOWLANDS took home top honors with a time of 30.789. Following Gatlin was Rich Fellers and WORDSWORTH II in second with a time of 31.648. Going home with the third place ribbon was Susan Hutchinson and GAMEBOY in a time of 32.392, followed by Francie Nilforushan and VIRGINIA 173 winning fourth place in 35.565. Callie Layland and LIO LETAASH rounded out the top five in a time of 33.061. Elizabeth Gingras stepped up her game this week and took home top honors in the $15,000 KindredBio 1.40m Jumper Classic aboard COUP DE CHANCE. Gingras jumped to a first place finish in a time of 37.629. Taking home second and third place honors was Perez aboard VALENTINO and EXTRA MINKUS in times of 38.730 and 39.980, respectively. The fourth place honors went to Tina Yates and CICOMEIN VDL in a time of 40.823. Rounding out the top five in the Classic was Gareth Graves and BILLY PUKKA in a time of 42.780. Spectators and exhibitors joined us for an exciting afternoon on Sunday for the $70,000 Osphos Grand Prix. Riding to a first place finish was Nicole Shahinian-Simpson aboard AKUNA MATTATA. A very competitive and naturally fast duo, they crossed the timers in 36.893. “She’s very competitive, she knows the sport so I just have my gear since she is now at a point where she is quite confident in herself and likes the challenge,” Simpson exclaimed. 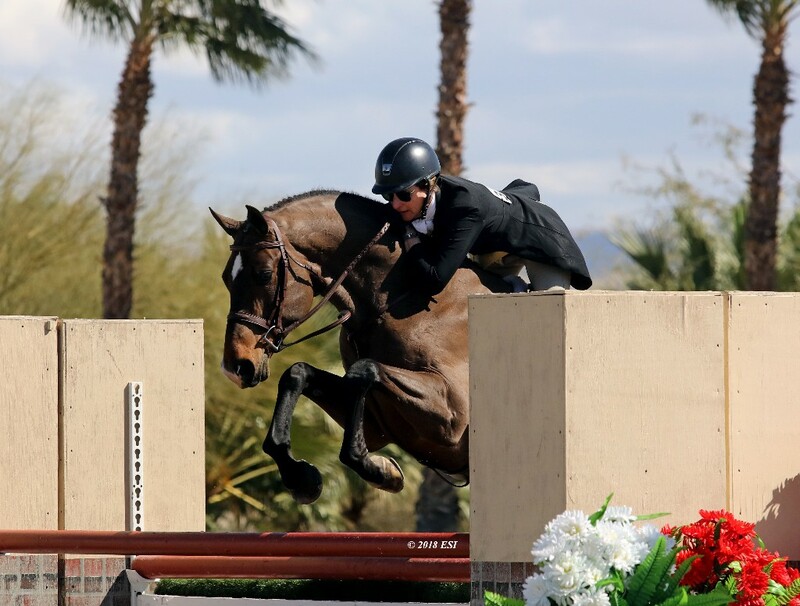 “She’s a blast to ride and I am so fortunate to have her.” This team will be competing here at the HITS Coachella Desert Circuit for the next three weeks and are gearing up for the AIG Million Week VIII. 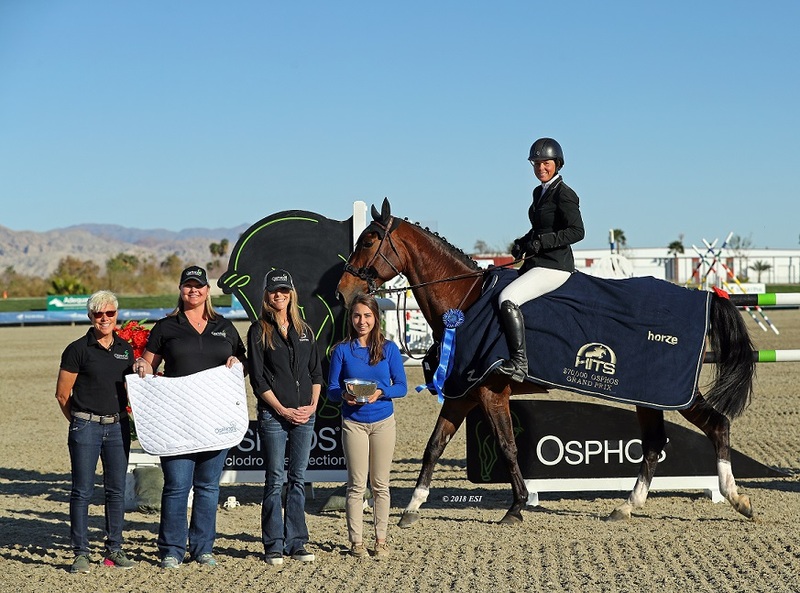 Nicole Shahinian-Simpson and AKUNA MATTATA pose with the Osphos Team for their win picture after the $70,000 Osphos Grand Prix. Taking home second place honors in the Grand Prix were Yates and DURANGO VDL in a time of 38.250, followed by Barge and LUEBBO in 38.335. Winning the fourth place ribbon was Charlie Jayne and his teammate AMICE Z 38.474, and rounding out the top five in the class with just four-faults in the jump-off was Casady aboard VALINSKI S in a time of 37.070. In the Devoucoux and Platinum Performance Hunter Prix, riders are competing for not only the blue ribbon and top honors in the class each week, but also a chance to qualify for the HITS Championship that takes place September 5-9 in Saugerties, New York. The top three finishers in the $5,000 Devoucoux Hunter Prix were separated by just one point each, with Shelley Campf and NEW LOOK taking home the top honors with scores of 85 in Round One and 86 in Round Two for an overall score of 171. Lexi Wedemeyer was awarded both second and third place honors aboard WISH LIST and CATHARTIC, respectively. WISH LIST received sores of 86 and 84 for a combined score of 170, and CATHARTIC, scored an 84 in Round One and an 85 in Round Two for a two-round total of 169. Shelley Campf and NEW LOOK score a 171 to take home top honors in the $5,000 Devoucoux Hunter Prix. In the non-professional prix, the $1,500 Platinum Performance Hunter Prix, Anne Marie Mueller and ATHABASCA took home top honors in the class with impressive scores of 87 and 84 providing a two-round total of 171. Coming in second was Stephanie Ray and CASTLE HILL with a score of 78 in Round One and 82 in Round Two for a two round total of 160. Alexis Meadows and LUGANO would be awarded the third place ribbon with a score of 80 in Round One and 78 in Round Two for an overall score of 158. 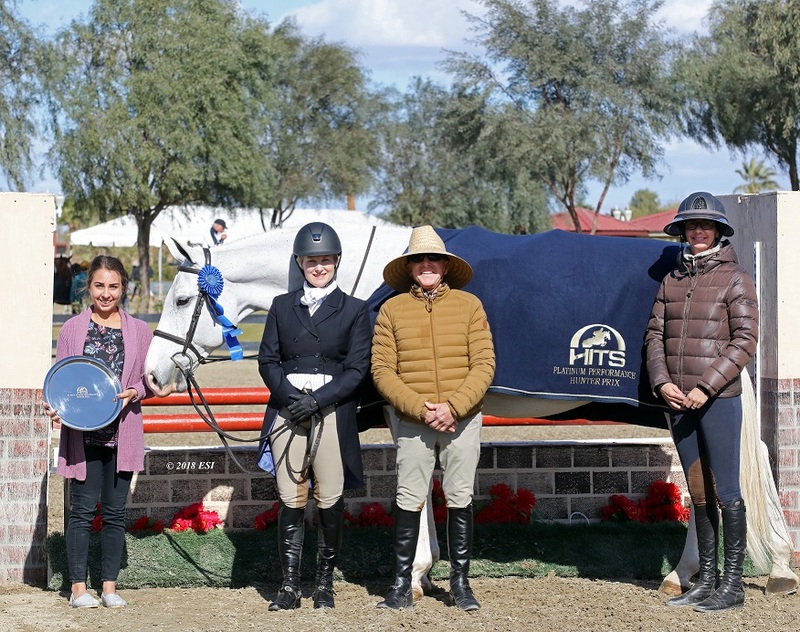 Check out HitsShows.com for a full listing of results, current 2nd Half and Overall Grand Circuit Champion standings, and upcoming special events that will take place right here at the HITS Desert Horse Park.